Venha desfrutar o sol, a piscina e a tranquilidade do monte, perto das praias. No nosso alojamento rural poderá desfrutar de agradáveis momentos em família com todas as comodidades e conforto. Tem ao seu dispor um bungalow com ar condicionado, aquecimento em todas as divisões, cozinha equipada, churrasco, piscina privada, estacionamento privativo, e uma área comum com parque infantil, mesa de ping-pong e matraquilhos e jardim. O bungalow tem 1 quarto de casal, 1 quarto com 2 camas de solteiro, sala com Kitchenette e wc com chuveiro. A ocupação máxima permitida é de 4 adultos. O Monte da Caldeirinha fica situado no Sotavento Algarvio, no concelho de Tavira, mais concretamente no sítio do Belmonte, entre o mar e a serra, numa zona calma e muito agradável. Fica a 12 Km de Tavira, a 4,2 Km de Moncarapacho, a 6,9Km da Fuseta e a 31,5 Km do aeroporto de Faro. Tem excelentes praias nas imediações como por exemplo: Barril, Ilha da Fuseta, Terra Estreita e Ilha de Tavira. Caso prefira um passeio pela serra poderá visitar o Cerro da Cabeça, o Cerro de São Miguel, as freguesias de Santa Catarina da Fonte do Bispo ou Cachopo. Também fica perto de campos de golf. Esta propriedade é da nossa família há várias gerações. Aquecedor em todas as divisões. Temos ao seu dispor toalhas de praia, guarda-sol e saco térmico - principalmente a pensar nos clientes que voam em lowcost :). Lugar muito tranquilo, limpeza excelente, jardim privado e muito bem cuidado. Arlete und ihre Schwester haben das Ferienhaus komplett ausgestattet und sogar ein üppiges Frühstück inklusive herrlicher Früchte aus dem Garten für den ersten Morgen vorgesehen. Der Blick auf Orangen-, Zitronen-, Oliven- und jetzt blühende Mandelbäume ist wunderschön, das Objekt ist ruhig gelegen. Selbst gebackenes Brot überrascht uns während des Aufenthalts. Das Haus ist klein, aber im großen Garten und auf der Terrasse gibt es viele bequeme Sitzmöglichkeiten. It was a pleasure to have you and your friends at our house. You have taken very well care of our house. Nous avons passé deux très bonnes semaines dans cette location, petite, certes mais bien pensée et bien équipée. Nous avons pu visiter la côte et la partie espagnole car elle est bien située. On y est au calme et Arlete et sa famille se sont bien occupés de nous. Ce fut un plaisir de vous accueillir et de vous remercier de prendre soin de notre maison et de l'avoir sans faille. We had a wonderful, relaxing holiday in your "little house" on your delightful small holding. We received a very warm welcome with lots of extras waiting for us, including breakfast, wine & lots of fruit from your garden. It is a very peaceful garden with fruit & vegetables to pick, goats & chickens as well as swimming pool & games area. You gave us freshly baked bread, squid caught by your husband & a marvellous evening boat trip, thank you so much. We had a wonderful relaxing holiday and would recommend you highly to anybody wanting the tranquility of rural Portugal, it was superb! We are very pleased to welcome you in our home. We try our best to give our guest good memories of the stay in our house. Our goal is make the guests happy and nothing is better than know that our guest wish to came back again some day. Wir (Familie mit zwei kleinen Kindern) hatten zwei sehr schöne Ferienwochen im Ferienhaus und haben uns sehr wohl gefühlt. Das Haus ist zwar sehr klein und etwas beengt, jedoch super ausgestatt und gepflegt. Das Highlight ist jedoch der sehr schöne Garten, die Ruhe am Pool und die tolle Terasse. Hier ließ es sich wunderbar aushalten und entspannen. Die Vermieterin ist ganz toll und man fühlt sich wie ein Teil der Familie. Es gab immer frisches Obst und Gemüse aus dem Garten. Auch die Lage ist für Ausflüge ideal, man erreicht alle Algarve Spots mit dem Auto wunderbar innerhalb kurzer Zeit. Wir können das Haus ohne Abstriche weiterempfehlen und es entspricht den Bildern und Informationen. You are a very nice family. We have had a wonderful vacation in the holiday home! The cottage is more than complete, nice veranda with high table and low couch and table. 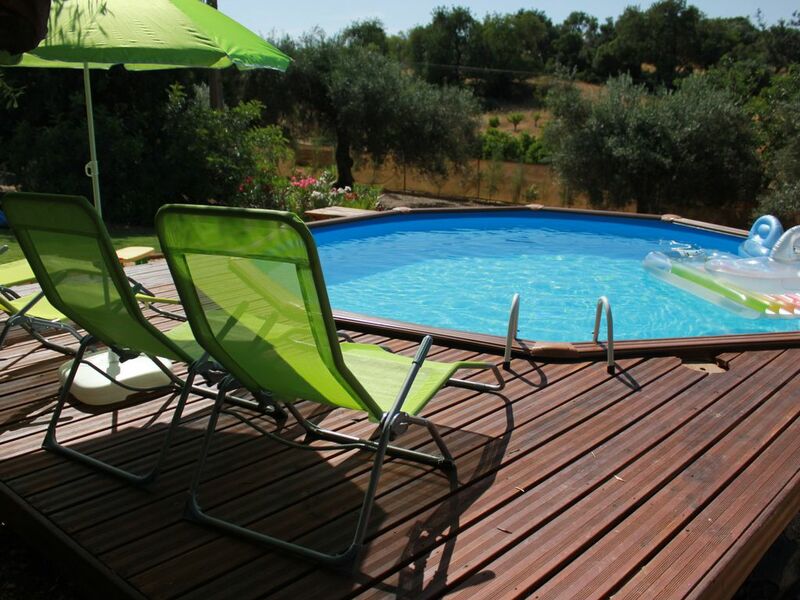 A nice barbecue and garden, between the old olive and almond trees, with swimming pool and table tennis table are fantastic! The house and surroundings are very clean, the towels clean and soft and there is a lot of fun for children. Arlete and her family are genuinely warm and welcoming. Upon arrival a warm welcome awaited us with delicious local products and products from our own garden. Blessed! The environment is also very beautiful, a lot of culture and nature to see. You do need a rental car to get there and to see the surrounding area. We are grateful to have received your family in our accommodation. Thank you for taking care of our home as if it were yours. You are a very nice family and we will be happy to welcome you again at any time.